The restaurant industry in DC has been absolutely transformed over the last decade. Once known for stuffy steakhouses filled with lobbyists, Washington can now boast to have one of the hottest food scenes. In fact in 2014 Bon Appetit named Capitol Hill’s own Rose’s Luxury the best restaurant in the country! So why, oh why, is it so hard to get some decent chinese food??? Any of you who have been to DC’s Chinatown will know that its laughable to call it so, unless making Ann Taylor Loft and Starbucks have their signs in english and chinese somehow makes it authentic. I was spoiled by years of great dim sum in Boston’s Chinatown and visits to San Francisco and New York. There are amazing Vietnamese and Korean places but not so for chinese food. 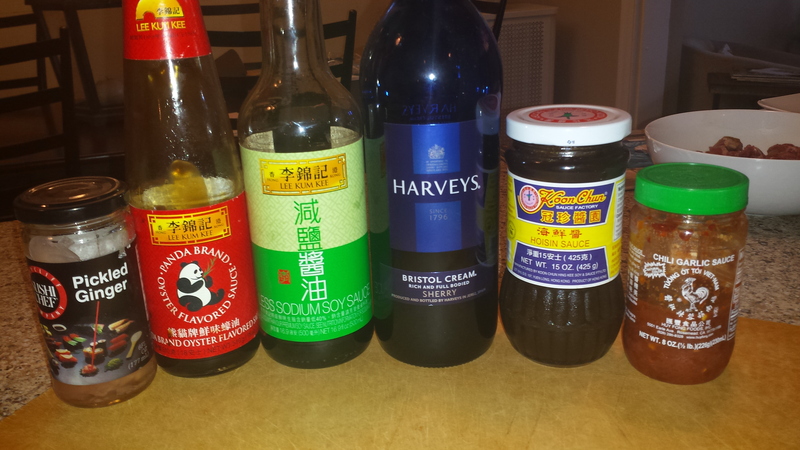 So if you have a craving for some yummy chinese take out the best option is really to make it yourself. Honestly even if you do live in a place blessed with decent chinese, cooking it yourself is often quicker than waiting for delivery and certainly a lot healthier. 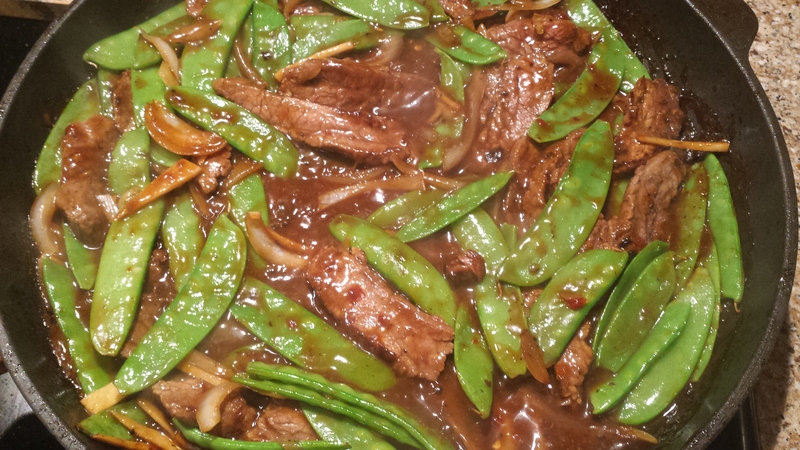 One of my favorite make at home take out options is this ginger beef recipe. The mix of pickled ginger (that funny pink stuff served with sushi) and fresh ginger is great. 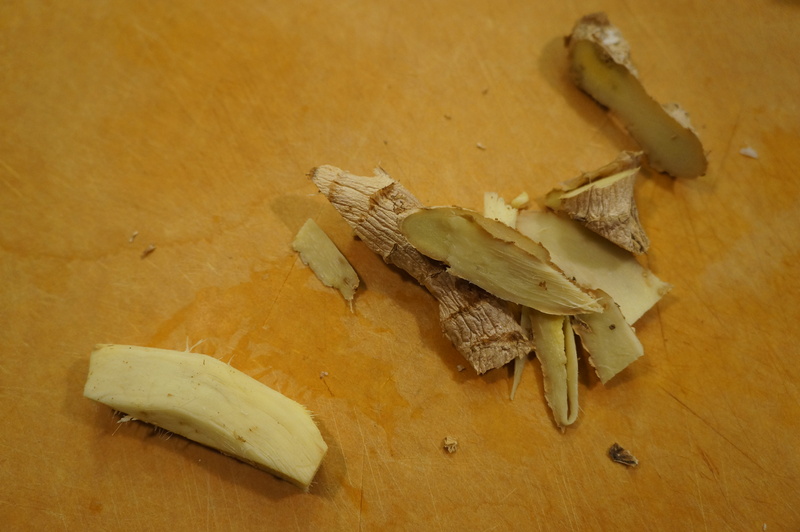 Ginger root can be sort of intimidating at first but don’t be scared off by its gnarly exterior. Cut off the peel with a small paring knife (though I see lots of people telling you to scrape it off with a spoon) and you expose the spicy, fragrant, edible part. 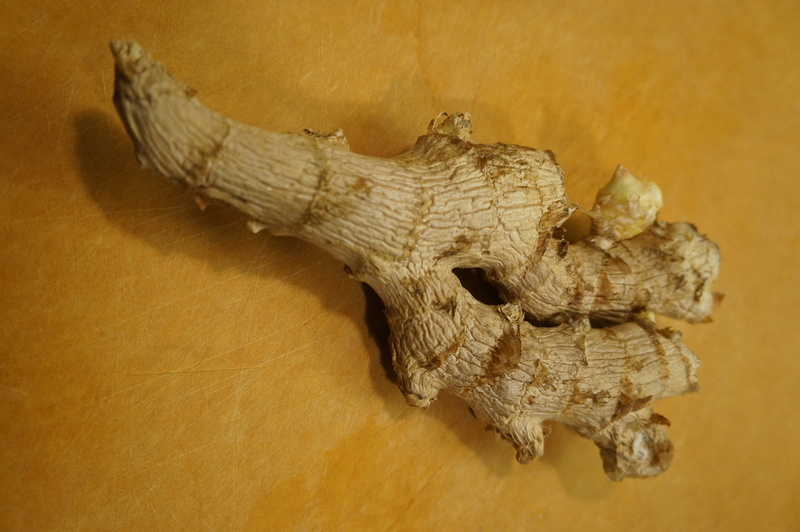 Ginger can start to get shriveled up after a while so if you aren’t using it frequently try freezing it. Once you have peeled it throw it in a freezer bag for months – bonus that its much easier to grate and cut when frozen. This stir fry is great because you can add in any vegetables you like, I used snow peas but sugar snap peas, bell pepper, green beans, any would work. You can increase or decrease the amount of ginger or chili sauce depending on how hot you want it or do what I do and make the full sauce recipe but only half the beef so there is lots of it to sop up with rice or noodles. Either way its a fast, delicious meal that is great as leftovers – just like good chinese take out should be. In a bowl, whisk the sherry with the soy sauce and cornstarch (this is called a slurry – no idea why). Add the steak and turn to coat with the marinade. Let it sit while you prep the rest of the ingredients. In another bowl or liquid measuring cup, whisk the broth, sherry, oyster sauce, hoisin sauce, chile-garlic sauce and cornstarch. Heat a skillet over high heat for a minute or two. If you have a wok use it by all means but a skillet can do the job and won’t take up as much space. I find nonstick is the best for stir fries as you can use less oil – the hands down best pan is Swiss Diamond. Pricey but totally worth it and often hugely discounted at William Sonoma Outlets if you are near one. Add 1 tablespoon of vegetable oil and let it get hot. Add the beef using a slotted spoon so you just get the beef and not the marinade it’s sitting in. Be careful here – when the beef hits the hit pan it might spit and splatter a bit so make sure you are wearing an apron. Let the steak sit for 1 minute so it can brown then move it around the pan till its cooked to your liking – only another minute should do if you have cut it thinly. 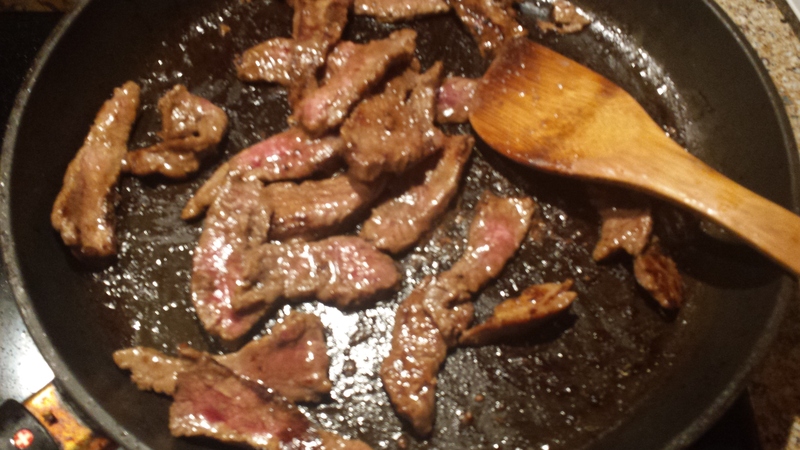 Scoop the steak out of the pan and add a little more oil if you need. Add the fresh ginger, onion, and snow peas and cook for about 2 minutes, just so the onion is no longer raw. Toss the steak back in along with the pickled ginger and the sauce you made earlier. Cook it down and stir it around until everything is combined and the sauce has thickened a bit, probably 1 minute more. In a bowl, whisk the sherry with the soy sauce and cornstarch. Add the steak and turn to coat with the marinade. Let it sit while you prep the rest of the ingredients. In another bowl or liquid measuring cup, whisk the broth, sherry, oyster sauce, hoisin sauce, chile-garlic sauce and cornstarch. Heat a skillet over high heat for a minute or two. Add 1 tablespoon of vegetable oil and let it get hot. Add the beef using a slotted spoon so you just get the beef and not the marinade it’s sitting in. Be careful here – when the beef hits the hit pan it might spit and splatter a bit so make sure you are wearing an apron. Let the steak sit for 1 minute so it can brown then move it around the pan till its cooked to your liking – only another minute should do if you have cut it thinly. Scoop the steak out of the pan and add a little more oil if you need. Add the fresh ginger, onion, and snow peas and cook for about 2 minutes, just so the onion is no longer raw. Toss the steak back in along with the pickled ginger and the sauce you made earlier. Cook it down and stir it around until everything is combined and the sauce has thickened a bit, probably 1 minute more. I need to stop reading your blog when I’m hungry.